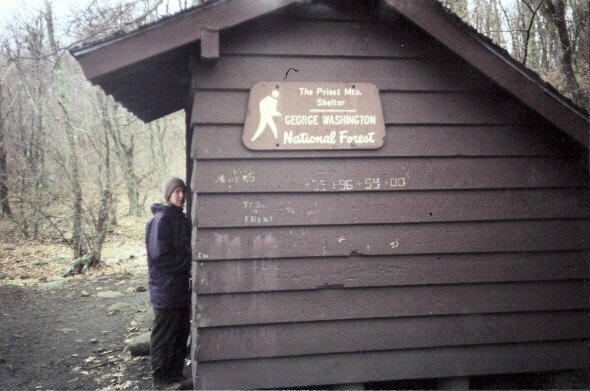 4/1/2001- I met Charlie Johnson, Bill and Chris Isham at the Rockfish Gap, VA Visitor's Center at around 11AM. The weather was in the upper 40's with occasional rain. I was concerned that the weather would be a factor for this 5-day 54-mile (which turned out to be 55.6 miles in the 2001 AT Data Book!) backpacking trip along the AT from US60 to Rockfish Gap, VA that we were about to undertake. It would be. We left my car at the Visitor's Center and took Bill's down to the US60 wayside, where we would begin the hike. On the way down the rain would mix with snow as we would increase our elevation along the Blue Ridge Parkway. We were surprised that the Parkway was not closed due to inclement weather. We didn't start the hike until around 1:00PM. It was to be a 4.5 mile 2,000 foot climb over Bald Knob and then stay at the Cow Camp Gap Shelter. As we neared the summit of Bald Knob the rain again would change to snow. Then, as we descended it would change back to rain. 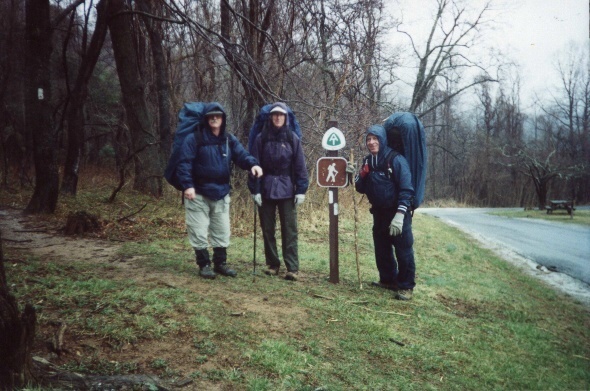 As I turned from the AT onto the shelter side trail the rain suddenly turned to sleet. It was sleeting hard for the .6 miles that I had to trudge to the shelter. I was wet and cold when I got there (last as usual). Just as I got to the shelter, the sleet turned to snow! It would continue snowing most of the night, blowing into the shelter and making for a miserable night. Yuk! 4/2/2001- We awoke to a cold and snowy morning. It snowed about an inch at the shelter and about 4 inches on top of Cold Mountain, the first big up that we had right out of the shelter. This would prove to be a grueling day for me. We had to do 10 miles and get to the Seeley-Woodworth Shelter. The views on top of Cold Mountain were fantastic, but snow and wind made you want to get off of there as fast as you could. The sun did come out but it was cold. The day was a series of ups and downs. A low flying fighter jet buzzed us during the day. The noise on the mountain from the jet was deafening due to the colliding sound waves. I was hurting when I got to the shelter that night. 4/3/2001- Another cold night. Today was supposed to be an easy day. Only about 7 miles and The Priest Shelter was the goal. That was good but we had two 4,000-foot ascents today. So it turned out to be another tough day. The skies were cloudy all day and would occasionally give a little moisture but no real rain. We climbed over Spy Rock, which gave a great view, then 4,000-foot Maintop Mountain, which had no view. Then we started a wicked ascent of The Priest Mountain, which again was over 4,000 feet. We got to the Shelter around 4:00, which gave us a chance to leisurely prepare dinner and set up our sleeping gear. However, we could not enjoy the leisure time too much because it was again getting cold. 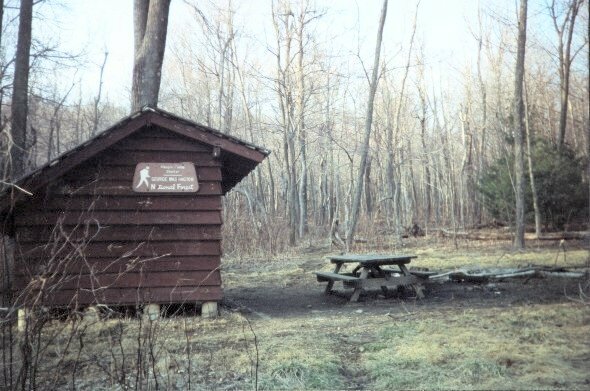 4/4/2001- During the night 2 jets buzzed the shelter. Bill said that he saw the afterburners from 2 jets go right over the shelter. I was buried in my sleeping bag and didn't bother to look. The next morning it was again foggy and threatened rain. We went over The Priest and started a grueling 4-mile down to the Tye River at 970 feet where we ate lunch. We then started a grueling 2-mile up. It was here that I met Comer and Jane, a nice couple from GA who had been thru-hiking since January! We decided on taking the shortcut Mau-Har Trail. It saved us 2 miles, showed us some breath-taking waterfalls but was a very tough trail to navigate. It was all up over a rocky streambed. Again, when I got to the shelter I was bushed. We again ate and retired early due to the cold. This time we had some strange birds keeping us awake right near our tents. One sounded like he was saying 'Beep' while the other sounded like he was saying 'What the h$#@'. Anyway, Charlie chased them away by beating the bushes around his tent with his walking stick! 4/6/2001- This day started out good. The sun came out for a change. The first 3 miles were a swift up and a down to Reed's Gap. Not bad. The next 3 miles were along crappy, rocky trail along the western slope of the Parkway. It took us a long time to navigate this stretch. We were aching after it. Then we had to ascend Humpback Mountain. This was tough. We had to navigate ups and big piles of boulders. I was waiting for a snake to pop out from between the boulders like a scary amusement ride. We made it to the top of Humpback for some great views. Then started the long descent down. We camped half way down the mountain between 2 springs along an old logging road. Doyle was attempting his 5th or 6th thru-hike. He signed in the log book sometime in March. We then did 5 miles of ups and downs through some old ruins and pristine forest and FINALLY ended up at Rockfish Gap and back in our car. This was a tough trip. The fact that I was out of shape and that we had 4 (though we only did 3) 4,000-foot mountains to go over did not help. This was a beautiful section of trail and probably is easy for the thru-hiker. However, the out of shape section hiker (like me) better be prepared for a challenging stretch of trail on the AT along the Blue Ridge Parkway between US60 and Rockfish Gap, VA.